A provocative debut novel, Seven perfumes of Sacrifice, by American author Amy Logan, explores the untold truths about honour killings in the Arab world. Logan, from San Francisco, devoted a decade to digging up where, when and why the femicidal custom got its start. It wasn’t easy as people were less than keen to talk about it. The UN estimates that 5,000 women are killed annually as a result of so-called “honour killings” but the actual figure may be considerably higher. Indeed, Logan believes that 800 million women worldwide may be living in constant fear of the life-long death threat of honour killing as part of their culture. Logan first learned of honor killing in the ’90s when she traveled to Israel on a press trip as a travel writer. She spent an afternoon in a Druze village – a secretive, Arabic-speaking, thousand- year-old offshoot of Islam who live in the hill towns of Israel and several other neighboring countries. 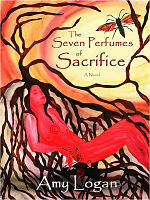 The Seven Perfumes of Sacrifice is available on Amazon. Logan is giving 10% of the book proceeds to the Global Fund for Women. Honour violence doesn’t just happen in Islamic world though. Here in UK, your husband can lie or/and cheat on you and if you challenge him on it, you end up beaten to a pulp. It wont be called honour violence, but that’s what it is. 1 in 3 cases of UK honour violence happen when a women becomes pregnant. Domestic violence sounds so much more civilised that a male conducted DIY abortion doesn’t it?